Raymond Artz played professional basketball on a team backed by his father that was considered the best independent squad in Eastern Pennsylvania for many seasons. In early December of 1911, the Artz Club was hired to represent the struggling Washington, Pennsylvania franchise in the fast Central Basketball League. The Artz Club had lost only a handful of games over the past two seasons, but was winless in sixteen games against the much tougher CBL competition before the franchise folded. 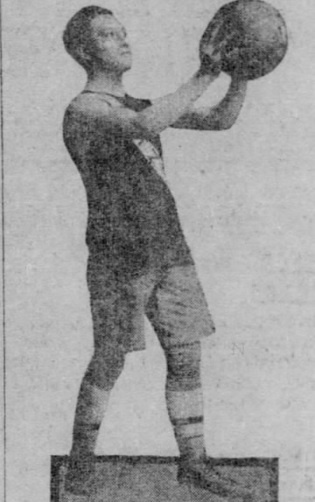 Artz had more success three years later during the 1914-15 season when he led Mount Washington to a 21-2 record and the championship of the Western Pennsylvania Basketball League. In later life, Artz was an executive at Vanadium Steel Corporation in Latrobe, Pennsylvania and became a very successful stock investor and well-known philanthropist..
Raymond Randall Rudolph Artz Born: Mar 31, 1891 Died: Jan 29, 1976 Hometown: Allegheny, Pa.